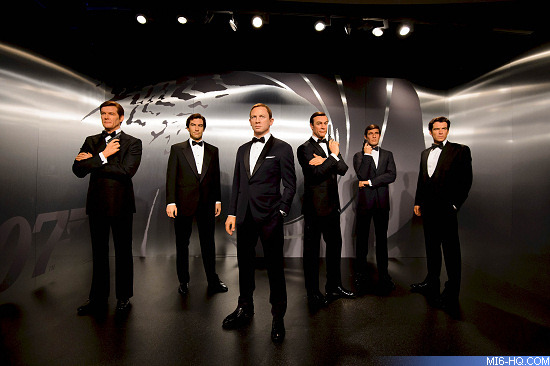 The line-up of Sean Connery, George Lazenby, Roger Moore, Timothy Dalton, Pierce Brosnan and Daniel Craig are at Madame Tussauds New York for a limited time only, before embarking on to the next Madame Tussauds in their tour. Created in close collaboration with EON Productions, the experience gives fans the opportunity to stand side-by-side with all six Bonds - in the same place, at the same time. Guests are invited to see how they measure up to each 007, pose with their favorite and take a stand out profile picture. The figures took a team of twenty artists, four months to complete at a cost of over one million dollars. Hundreds of layers of oil paint were used to build up accurate skin tones and each hair on all of the figures' heads was inserted individually by hand over a six week period. The exhibition will be hosted in the New York City location (234 W. 42nd Street New York, NY 10036) until the summer, when the tour moves on to Las Vegas.